One third of private rented homes don't meet basic health and safety standards. Close to a third of private rented properties don't meet the official Decent Homes Standard, but health and safety is only one possible reason a home can fail that. 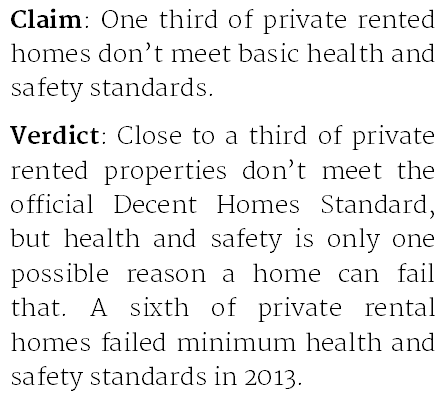 A sixth of private rental homes failed minimum health and safety standards in 2013. "A third of private rented homes are not meeting basic standards of health and safety"
In his first speech to the Labour party conference as leader, Jeremy Corbyn claimed that a third of all private rented homes don't meet basic health and safety standards. This isn't quite accurate. It's true that just under a third of private rented homes don't meet the government's Decent Home Standard, but minimum health and safety standards are just one of four criteria which a property has to meet in order for it to be considered 'decent'. If we're talking about health and safety alone, 17% of private rented homes don't meet the minimum standard. So more like a sixth than a third. Councils use the Health and Safety Rating System (HHSRS) to assess for 'Category 1' hazards. These are the most serious examples of hazards such as dampness and mould, unsafe electrical wiring and poor hygiene among others. Based on the structural integrity of the building and the need for repair works. Homes which fail to meet this condition lack at least three of the following: a kitchen no older than 20 years, bathrooms no older than 30 years, good noise insulation and a sensible layout (in various areas of the property). This includes adequate insulation and a functional heating system. Of the private rented homes failing to meet the Decent Homes Standard in 2013, 55% contained at least one Category 1 hazard, 45% did not provide a reasonable amount of heating, 23% were in a state of disrepair and 11% lacked modern facilities. The government's English Housing Survey distinguishes between four types of tenure: owner occupied, private rented, local authority and housing association. The last two are sometime taken together as 'social rented', as we've done in our graphs below. Although private rented homes are more likely to have a Category 1 hazard than others—17% compared with a cross-tenure average of 12%—standards have been improving. 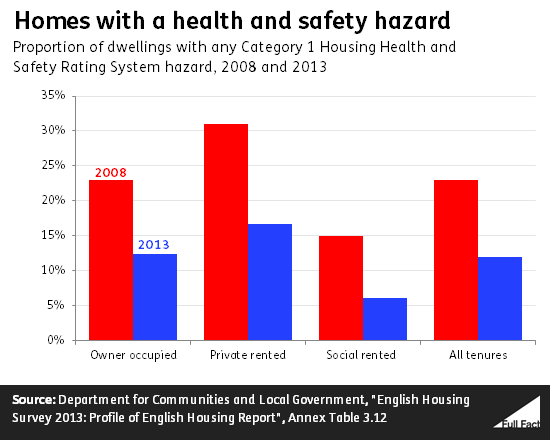 Between 2008 and 2013, the proportion of private rented stock with a Category 1 hazard fell from 31% to 17%. The Housing Survey puts these improvements down to the government's drive to improve housing standards in the social rented sector and increased local authority enforcement against landlords in the private rental sector, as well as homes across all tenures becoming more energy efficient (which can reduce the risk of excess cold). Looking at the wider assessment of a home as 'decent', as opposed to safe, the picture is similar: private rented homes perform worse compared to other tenures, but there has been improvement across the board. One possible explanation relates to the age of housing stock. The private rented sector has the highest proportion of pre-1919 housing stock compared with other tenures, and generally speaking, the older a building gets, the more prone it is to disrepair. While this is true for all tenures, private rented homes also require more repairs than any other tenure for homes of similar age—at least for properties built before 1964. 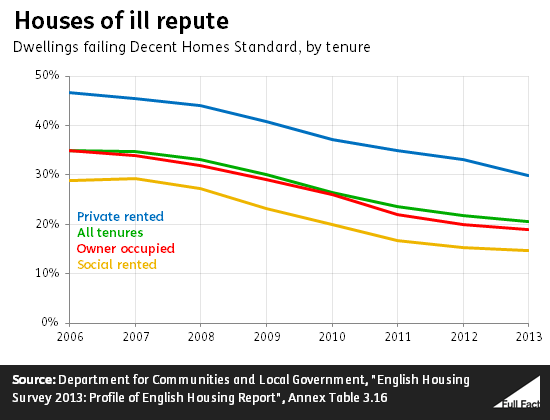 For more modern homes, social rented housing needs more repairs than private rented. Will changes to tax credits cost families £1,300 a year?